The summers in Glendale and Phoenix are scorching. When the heat becomes oppressive, one of the best ways to cool off is to take a dip in your very own pool. You can relax on a raft or sit on the stairs and just soak in the cool water, perhaps with a cool drink in your hand. When your electric pool pump or motor malfunctions, your cool oasis can quickly become uninhabitable. You can get the pump or motor repaired in most cases. However, when the parts age out or the cost of repairs starts to become far more than the cost of a replacement, you may want to consider getting a new Glendale electric motor. When that time comes, Run ‘Em Again Electric Motors is here to help. Run ‘Em Again Electric Motors maintains a huge stock of new pool motors and pumps to help reduce the disruption in service to your pool. 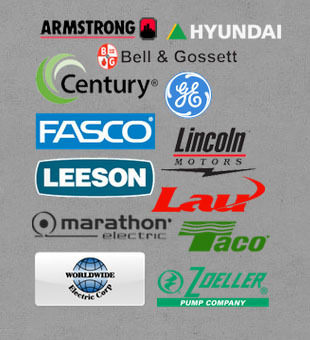 Our motors come from top brands such as Century, Fasco, General Electric, Hyundai, Lau, Leeson, Lincoln, Marathon Electric and Wordlwide. Our electric motors and pumps are available for both residential and commercial pools. If you prefer, we can also rebuild a Glendale motor for you. Run ‘Em Again Electric Motors has been serving the Glendale and Phoenix areas for close to 70 years. We have the expertise and reputation to give you a quality new electric motor in Glendale so that you can get back to enjoying your pool again as quickly as possible. Call us to find out how we can help you with all your Glendale pool motor repair and replacement needs, no matter how big the pool or its capacity. We’ll get you back in cool waters so you can take respite from the heat. We also offer affordable Phoenix AZ motor repair and rebuild services.